THE WAY FORWARD: CAN THE RIGHT CHANGE BE SUSTAINED IN ETHIOPIA? Lecture Title and Description: THE WAY FORWARD: CAN THE RIGHT CHANGE BE SUSTAINED IN ETHIOPIA? Ethiopia is in a state of great change. Many regard it as a miracle, a door that few believed could be opened, a glimmer of light that has resurrected hope for change that seemed impossible less than a year ago. This momentum for change has led to new freedoms and opportunities in many places and for many people. This includes the opportunity for Mr. Obang Metho to return to Ethiopia, after years of work as a defender of human rights and a promoter of humanity, unity, peace, reconciliation and the restoration of justice. That work, which started in 2003 with the massacre of Anuak in Gambella, expanded from an ethnic-based effort to a national movement as it became clear that the suffering of the Ethiopian people was widespread and deeply entrenched in a systemic structure of governance that favored some and devalued others. Meaningful reforms and sustainable change would not come to only one ethnic group in Ethiopia, like the Anuak, but would require systemic change based on a principle-based worldview that restored the value of every human being, putting humanity before ethnicity or any other differences; and, secondly, caring about our neighbor—in the case of Ethiopia, those in other ethnic groups—as the only way of bringing sustainable freedom to ourselves, for no one is free until all are free.These are the basic principles of the SMNE that can apply regardless of which political party or leaders come to power within Ethiopia. These principles also can help shape public and private institutions, civil society, business and communities. 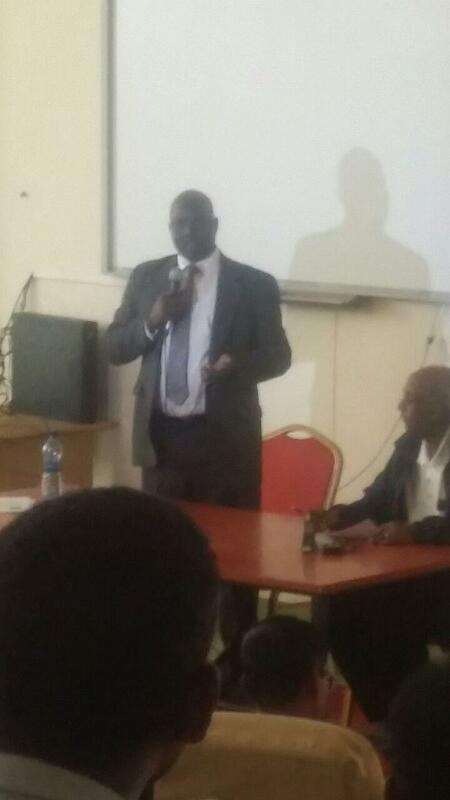 This lectureat the University of Gondarwill focus on “The Way Forward: Can the Right Change Be Sustained in Ethiopia?” Mr. Obang has been traveling all over Ethiopia, talking to many people and hearing their stories and concerns. Despite the many areas of significant progress, Mr. Obang sees the change in Ethiopia as being extremely fragile. He believes it must be nurtured, protected and supported if it is to be meaningful and sustainable. If we fail, we Ethiopians will simply reconstruct the past repressive years with more of the same— possibly under different leadership; or, even descend into something much worse than what we have had. In addressing these concerns, Mr. Obang will share his observations regarding the current model of ethnic federalism as being built on a commonly held, but self-destructive, worldview that will not bring the change we seek; but instead, will perpetuate divisions, conflict, injustice and favoritism, all of which will undermine our peace and security, both now and in the future. Mr. Obang will present many critical questions to think about. For example, what kind of vision will bring the most positive, long-lasting solutions? What kind of principles should we base this vision on and follow for the best results? How can these principles shape our leadership and the reforms we seek to bring for the common good of the nation and its people? Who are those within our society who can play a role, like our religious leaders, our elders, our educators, our youth, our families and many others? How can our cultural systems contribute, like those which have a working structure to promote justice, conflict resolution and care for those in need? How do we support a non-ethnicized rule of law, security force and justice system that will provide safety while we create room for dialogue and constructive ways to build a stronger society? Ethiopians face the very real challenge of bringing meaningful reforms to a country that has suffered much over the past decades; but yet, if we are not careful, we can recycle those same mistakes once again. Mr. Obang suggests its starts by talking to each other! Come and participate in the discussion! Can the Right Change Be Sustained in Ethiopia? Good Afternoon! “እንደምንአመሻችሁ”. It is an honor to be at the University of Gondar, one of the great universities of Ethiopia, located in one of the oldest cities of the country and even in the world. I would like to thanks Dr.Desalegn Mengesha,president of University of Gondar; Dr, AsratAtsedewoyin,vice president,Dr.KassahunTegegne, Dean of College of Social Science and the Humanities, MrAysheshimTerefe, Vice dean, College of Social Science and the Humanities andmembers of the staff for the privilege of speaking before you today. 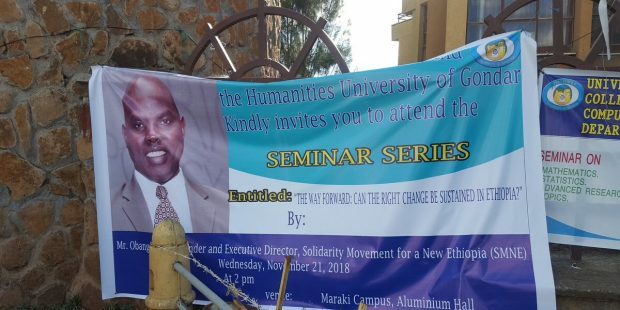 Since I arrived in Ethiopia over two months ago, yours is the first university to invite me to share with you a topic I believe to be of utmost importance. It begins with a question: What is the Way Forward? Can the Right Change Be Sustained in Ethiopia? There are no easy answers to this question or to its challenge; however, I would not be here today if I believed it impossible. Let me clarify. For the last 17 years, I have been working to bring justice, unity, freedom, reconciliation, peace and something better to Ethiopia; yet, in February, a colleague of mine said, “You know, Obang, this work we are doing is impossible, humanly speaking, but God can do the impossible.”At this time Ethiopia was in the crosshairs of potential violence and disintegration according to international experts as well as reports from people on the ground. Many feared that chaos, violence and killing could unpredictably erupt due to the rising tensions, anger, and ethnic divisions among the people. Yet, in April, the impossible happened, taking the country by surprise. We witnessed a break through from inside the EPRDF—the emergence of Ethiopia’s new Prime Minister Abiy Ahmed and his team. Many regard it as a miracle—a door that few believed could be opened, a glimmer of light that has resurrected hope for change that has been blocked for decades. We in the Solidarity Movement for a New Ethiopia (SMNE), were among the first to endorse PM Abiy and his team for he spoke our own language—the language of freedom, unity, and inclusion. The momentum for change has only increased ever since this time and has led to new freedoms and opportunities in many places and for many people; however, today I want to both caution and encourage you. The freedom we now celebrate in Ethiopia under the leadership of Prime Minister Abiy is fragile. In fact, the hardest challenges may lie ahead. Many countries, including Ethiopia, have overcome repressive governments only to fall into chaos and authoritarian governance once again. Why? They failed to build the right structures giving order and support to freedom for all its people, like a good and just Constitution and strong institutions to support good governance. Secondly, unless a society and its leaders embrace principles, values and virtues that acknowledge and strengthen the value, freedom and rights of all its people; its sustainability will be jeopardized. Today, we should take care to bring the right changes in the right ways so we do not sabotage or let others hijack the progress we and others have made so far. This has not happened in the past. In fact, each time we Ethiopians rose up to resist past models of repressive governance, whether the monarchy, feudalism, communism, Marxist-Leninism or mixes of all of the above with tribalism added in, it has not led to improvements. We are now at risk of doing the same. How can we increase our insight into our cultural strengths and weaknesses so we can avoid the pitfalls and instead bring something much better and lasting? I will cover my thoughts on our current model of ethnic-federalism, but first let me share how I came to this work, presently as the Executive Director of the MNE and its foundational principles of putting humanity before ethnicity or any other differences; and secondly, caring about our neighbor—in the case of Ethiopia, those in other ethnic groups—as the only way of bringing sustainable freedom to ourselves, for no one is free until all are free. I believe these principles can help shape a better future for all Ethiopians. My own journey started in Gambella, but when I was 17, I emigrated from Ethiopia to Saskatoon, Canada, living alone without family in a place where few Africans were found; yet, it was a good place where I made lifelong friends. After finishing a degree at the University of Saskatchewan, I decided to return home to Gambella to visit my family and friends as well as to see if conditions had improved. When I saw the desperate living situations of most of the people, including the lack of clean water, the absence of medical care, and the overall extreme marginalization of the region, my plans abruptly changed. Some were waiting for the federal government in Addis to bring development, but such hope was in vain because they were then a forgotten people. I felt compelled to try to help improve conditions. I returned to Canada and formed the Gambella Development Agency, (GDA) with the help and ongoing involvement of some of my professors and friends, including forming a partnership with the College of Medicine at the University of Saskatchewan. After two years of work for those in the whole region of Gambella, and the addition of many partners on the ground, the GDA was awarded a grant for a major medical project in the region. Before we could ever use it, I started getting calls of desperation from some of my Gambella colleagues, friends and family members, alerting me to a crisis building in the region over the government’s plan to control the region and to drill for oil on Anuak indigenous land without following the legal process as laid out in the Ethiopian Constitution or the international protocols for consulting with indigenous groups regarding land use rights. Neither was there consideration of the effect oil drilling might have on the fragile environment in this area of the Upper Nile. The Anuak were all disarmed and human rights abuses, intimidation and arrests increased. Some of the Tigrayan and Nuer people in the area hid the Anuak in their homes. The federal government blamed the Nuer, but it was not true. Human rights atrocities, arrests, torture and displacement continued for three years. After three years, the troops moved from Gambellato the Somali region where similar atrocities were committed. It was learned that the plan to teach the anuak a lesson, was initiated in the office of the former prime minister, MelesZenawi. There was not outcry from other Ethiopians, except for the head of the Ethiopian Human Rights Council (EHRCO), Professor Mesfin Woldemariamwho publicly wrote about it. Our large financial grant had to be turned down and I was faced with a choice. That choice I made is the reason I am with you today, but it was not easy. I personally knew 317 of the victims; they were colleagues, family and friends. I was in grief, but my grief turned to action. I became involved in human rights advocacy for the Anuak overnight.I realized I had choices as to how to react. I cannot say this was easy; it was a process for me. One choice I could have taken would result in claiming victimhood and developing an attitude of bitterness and a desire for revenge against perpetrators, those complicit, or those who were bystanders. I could have erected an ethnic-based barrier between myself and outsiders, devaluing them because they were not from my own group nor did they share my own skin color in the case of Gambella. I also could have gone further to form a liberation front or secession group to try to secede from of Ethiopia; however, I saw that the “us versus them” thinking had the potential of leading to our mutual destruction or insecurity. I could have said, over 400 of my people were killed, a people who had been called endangered by Cultural Survival since 1984, mostly due to the fact we lived on very fertile land with many resources.The Ethiopian government wanted the land and resources, in this case, the oil, but not the people; that is, unless they were needed to die for the country like numerous young men who were forced into the military to defend Ethiopia during the Eritrean war.This has been the nature of our country, not only in Gambella, but in most every region. The people are devalued and discardable unless they are needed to meet the interests of the ruling party and the more powerful. Can this kind of dehumanization and devaluation of other human beings outside one’s own ethnic group bring sustainable freedom, peace and justice to Ethiopia? Yet, when fear and insecurity strike, many cling to cultural or tribal affiliations. Sadly, this sometimes leads to the formation of resistant camps that pursue personal or tribal benefits while denying the same for others. The majority of my Anuak people took the path that gave them insulation from others for their own protection. It was easy to embrace and was a temptation; whereas taking a different path, as I did, often caused criticism and rejection; but it was a taxi driver in Washington DC who helped me see that one group alone, like the Anuak, as a separated group from others, would only perpetuate the problems we face in our country. The simple story is that I engaged in a conversation with an Ethiopian taxi driver, GirmaNegash, who asked me where I was from. I told him to guess. He suggested Senegal, Cameroon, Nigeria, the Congo and then Ghana. I told him East Africa as a hint and he suggested Uganda, Tanzania, and Kenya. I said no and he asked for a multiple choice. I said: A) Ethiopia, B) Eritrea, C) Somalia and D) None of the above. Immediately he answered: D) none of the above and I told him he got it wrong. He was puzzled and said, “You don’t look Ethiopian, you don’t look Eritrean or Somalian and said, “You could be from anywhere in Africa with the only exceptions being Ethiopia, Eritrea and Somalia.”I told him I was from Ethiopia and he said, “No, you’re not; prove it!”I then said, “How are you?” in Amharic, in Oromo and Tigriyan and he responded with, “Whoa! You speak Amharic! How do you know all of these languages?” I asked him if he had heard of Gambella. Then he said, “Oh, yes, now I believe you! I’m sorry!” When I arrived at my destination, he refused to let me pay, saying, “You are my brother, you don’t have to pay.”There I was going to speak to a US Senator to help me find justice for the endangered Anuak people group while my fellow countryman did not even know I was part of his own country, let alone, he should have been the one to stand with me. This man forced me to realize that as long as we failed to reach out beyond our ethnic groups to embrace others, the freedom of all would be jeopardized. We needed to stand together— justice would never come to the Anuak until it came to my neighbors and beyond. It was a systemic problem, but to correct it; I had to reach out to embrace my taxi cab driver and stand together with him as well. No one is free until all are free. It is through the failure to value the humanity of others that perpetuates unjust systems that forget that each of us is created in the image of God and we will ultimately be accountable to Him; however, it also makes for peaceful and cooperative free societies. A tribal based approach to sustainable peace is not achievable. This was the beginning of the expansion of our ethnic-based organization, the Anuak Justice Council, to the broader vision of the SMNE for all Ethiopians. When I spoke before the US Congressional Subcommittee on Human Rights after the violence of the 2005 election, I told them I could not pick or choose between who is and who is not my fellow Ethiopian, that the people of Ethiopia all were part of my family of Ethiopians. In that speech, I said I never thought the day would come to address all Ethiopians. From that day on, I never stopped speaking for the wellbeing of all our people, based on these principles. Today I stand before you, at the University of Gondar to tell you that you are receiving a gift of opportunity right now. University of Gondar students and other students throughout Ethiopia,you are the first generation of youth today at this moment of opportunity. What will be the result of this movement for freedom? Will you be the generation that embraces the humanity of every Ethiopian, putting humanity before ethnicity or any other difference? Do you believe in a justice system that upholds the rights and freedom for your neighbor as it upholds your own rights and freedom? Will you choose principles, values and virtue? No society can flourish without virtuous people. Instead, what we have seen is greed, corruption, hate, self-interest, robbery, repression of truth and the disintegration of our institutions. We have used stolen words to claim the opposite. Ethiopia has been called a democracy when the EPRDF won the election by 100%. Anti-terrorism laws have been used against truth tellers and advocates for justice. Now to ethnic federalism;it is a subversion of the truth for it pretends to be for your group while undermining the freedom and rights of others. It was originally a deception to maintain power and control over the coalition members, while also dividing them from each other. It was a way to maintain an “us” versus “them” narrative so that for the powerful, favoritism could be manipulated in your self-interests while others were left out. Even our security in some places is “ethnicized” in favor of injustice. How do we change Ethiopia without looking at these problems through the courageous lens of truth? Where has our culture broken down? Where have our institutions and faith groups wrongly supported ethnic division, putting someone or something other than God on the throne—like worshiping our leaders or tribes as if they are gods. How can our youth lead a virtue-based movement towards truth, kindness, integrity, and character qualities that build people, communities and nations?How will our story end? Will you help restore principles and values to this movement of freedom.Will you help work towards undergirding this new freedom with structures that keep all of us accountable? Freedom is not only FROM past injustices but freedom should be a gift FOR a better shared future. It is good to come to Ethiopia to be among the people for whom we have been fighting for the last 16 years. This is a first time to be invited to speak at your university and to talk to the students, the future leaders of tomorrow. When Abiy and his change team came to the US, we met him and he extended an invitation to come to Ethiopia as the SMNE team. There were 16 of us from nearly every region of Ethiopia, from different backgrounds, ethnic groups and religions. We spoke fourteen different languages in all. Most of the team went back, but earlier, we had all gone to Gambella, wanting to use Gambella as the launching point of national reconciliation because of the massacre of the Anuak and the decision to use their case as an example of the choice to seek reconciliation, not revenge. After we came back to Addis, most of the team remembers left, but the remaining team including our extraordinary team leader, Edna Alemayehu, went to six regions of the nine and talked and listened to the people, young and old, about how to support the current change to make sure it led to lasting change. After talking to the people and meeting with government officialswe came to realize the country needed a national dialogue of reconciliation and conflict transformation because the change is still very fragile. We also realized that there is a need to engage the young people in critical thinking and to teach them about civic responsibility, leadership qualities, national unity, reconciliation and the principles foundational to maintaining a free society. We want to identify universities, high schools, faith groups, elders, women, entrepreneurs, law enforcement, justice institutions and many other stakeholders to reinforce the kind of change that will lead to more sustainable, principle-based freedom. Talking the talk must be followed by actions or it will be superficial and meaningless. You have a responsibility. This is your time. We are in a battle of visions not only of ideas because ideas can be disguised and diminished into a battle for dominance because competing groups hold to the same self focused goals. Why participate in a struggle unless it is based on advancing inclusive higher principles that will be just, right and good?Young Ethiopians cannot settle for anything less than virtue based principles and values that will make freedom sustainable. When freedom, truth and justice live in the hearts of the people, we will know that Ethiopia will be on its way to sustainable freedom, a gift to those who come after us. This is a call. God has a plan for our people and country. A year ago, many were expecting violence to break out; only a work of God could have ignited the change now happening. Let us be people who take this movement of freedom and take steps to nurture and protect it so we see it grow and produce a harvest of human flourishing in this ancient country of Ethiopia.